(Salt Lake City) When Utah taxpayers save for college with the Utah Educational Savings Plan (UESP), they can also save on their 2017 taxes. If they meet certain year-end deadlines, any contribution, up to the allowed maximum, that a UESP account owner makes to an account for someone who was age 18 or younger when designated as the account beneficiary qualifies for the 5 percent Utah state income tax credit or deduction. For example, a Utah account owner who contributes $100 to a UESP account in 2017 may claim a $5 credit. A $1,000 contribution qualifies for a $50 credit. A couple filing jointly who contribute $3,000 are eligible to claim a $150 tax credit. Plus, if a friend or family member contributes to an account, the account owner can claim that contribution for the tax credit up to the maximum allowed. 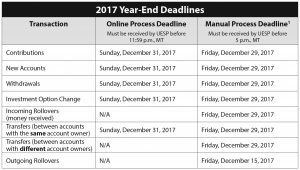 End-of-year deadlines are also approaching for other types of UESP transactions, including withdrawals, investment option changes, and rollovers. In addition to the Utah state income tax credit, earnings on UESP accounts grow tax-deferred. Withdrawals are free from federal and Utah state income taxes when used for qualified higher education expenses. Qualified expenses include tuition and fees; required books, supplies, and equipment; computers, related equipment, services, and internet access; and certain room and board costs at technical schools, colleges, and universities in the United States and abroad that participate in federal financial aid programs for students. UESP, Utah’s official nonprofit 529 college savings plan, is highly ranked by Morningstar, Inc. for its low fees and industry innovations, such as its customized allocation investment options. To learn more about the Utah Educational Savings Plan, visit my529.org, call UESP toll-free at 800.418.2551, or email info@my529.org.